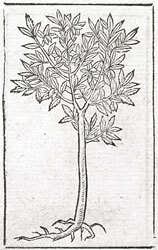 Alciato at Glasgow: Emblem: Amygdalus. Cur properans foliis praemittis amygdale flores? Almond tree, why are you in such a hurry to put out flowers before your leaves? I hate precocious pupils. 1. See Quintilian (Fabius Quintilianus), Institutio oratoria, 1.3.3: “the precocious type of intellect never easily comes to fruition”.